Don McNabb is a co-founder of Triterra and serves as the Chief Executive Officer (CEO) and Principal Scientist for the firm. He is responsible for overseeing implementation of the company’s strategic direction, while continually promoting the core values and focus of Triterra. Under his leadership, Triterra continues to utilize a creative, practical, responsive, and effective approach to address environmental challenges, while striving to exceed client expectations. 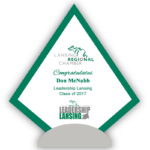 Don holds a Bachelor of Science Degree in Environmental Studies, Earth Science, and Natural Resources from Central Michigan University (Mt. Pleasant, Michigan). In addition to his studies and experience, he maintains professional certifications as a Certified Underground Storage Tank Professional (CP), a Certified Ground Water Professional (CGWP), a licensed State of Michigan Asbestos Building Inspector, and a Residential/Commercial Mold Inspector.